Hi everyone! It’s Laura here with an easy birthday card perfect for a boy! The stamp set I used is the Kobi Bearing Gifts stamp set. I stamped the images with Memento Tuxedo Black ink on Neenah Solar White 110lb cardstock and colored them with Spectrum Noir markers. I then die cut them with the coordinating dies. For the panel where Kobi is standing I used Ranger Alcohol inks in Turquoise and Cloudy Blue and one of the dies in the Dotted Patterns Set 3 dies. I used the same die set as well as the Dotted Ribbon and Frames dies to die cut two panels out of white cardstock. I adhered them to each other with one layer of foam tape. I also used foam tape to glue the images to my card front. I heat embossed the sentiment with white embossing powder over some black cardstock and trimmed a thin strip around it. I finished off the front of the card with a scattering of May Crystals. I mounted everything on a top-folding A2 card base and I decorated the inside by stamping more balloons and the sentiment happy birthday from the Kobi Bearing Gifts stamp set. You can have a peek at the inside of the card in the video tutorial linked below. And that’s my card for today! 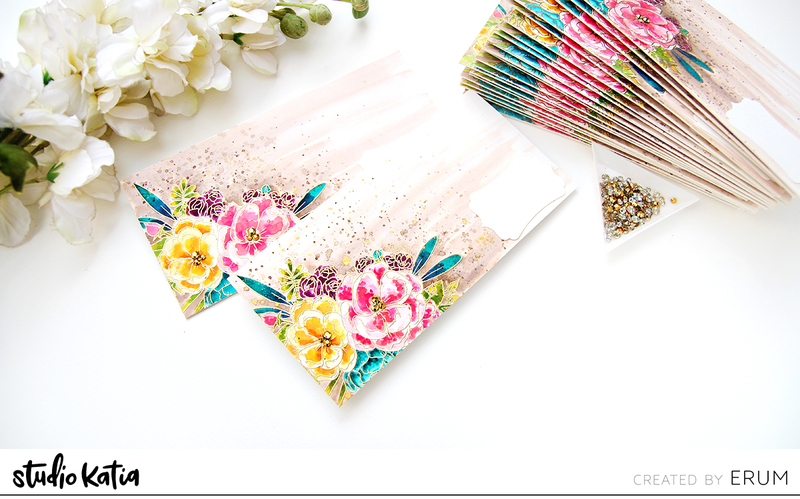 As I mentioned, I filmed a video tutorial showing you how to create this cute birthday card. You can watch it down below or directly on the Studio Katia channel. And that’s it for today! I really hope you like this card and enjoyed the video! Thank you all so much for stopping by and have a great day! 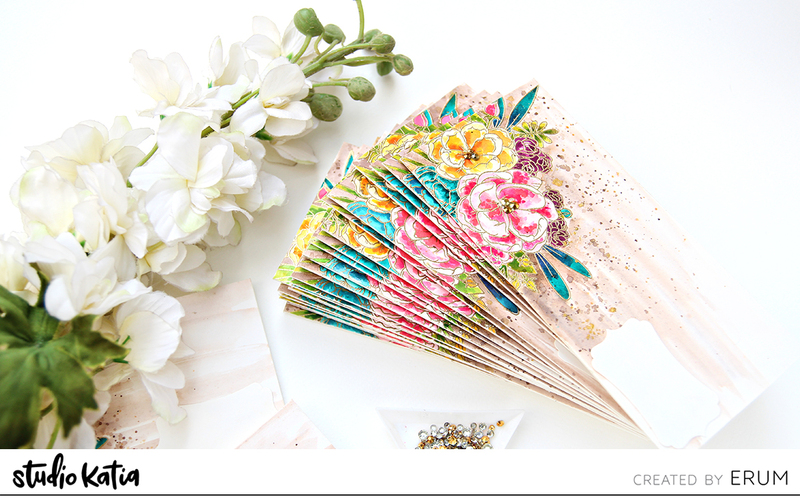 I think we can all agree that sympathy cards are probably one of the hardest to create and I know I see a lot of posts online from people asking for people to recommend a stamp set for sympathy cards and the one I recommend is the You’re So Sweet stamp set. The reason I like this stamp set is because it has sentiments for most occasions. 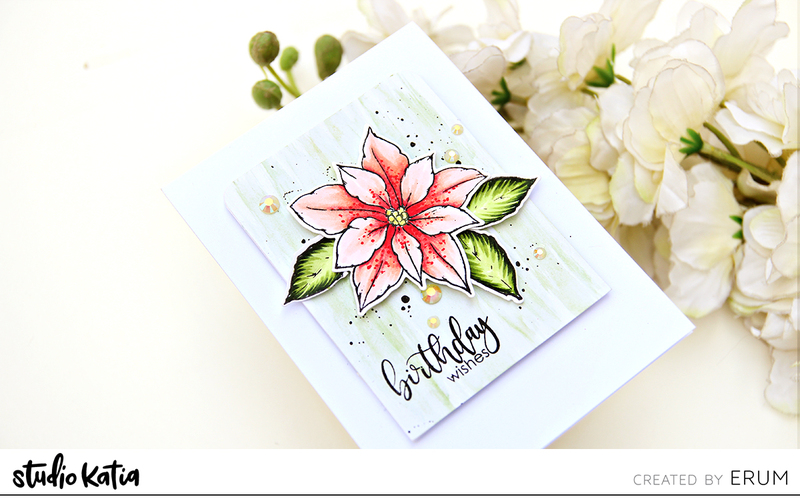 I started off with this card by stamping the largest floral stamp onto Neenah cardstock and then coloured it using Ice Grey Spectrum Noir Markers. I then used the matching dies to cut the image out. I die cut another piece of Neenah and added some silver splatter using a silver pigment ink. Once the ink was dry I stamped the sentment and started to assemble the card. I added some foam tape to the back of the floral image for some dimension and for a little something extra I added some clear drops. I think greyscale is often overlooked in card making and it is a good neutral colour scheme to go with and I always love how it looks. Thank you so much for stopping by today, I hope you have a great day and stay tuned for our new release which is coming VERY soon. Hi there everyone! Erum here today and I have floral, watercolour, money envelopes to share with you. 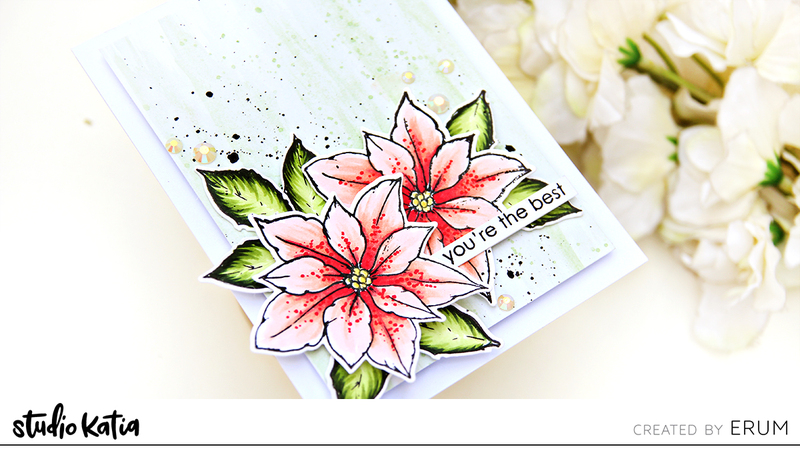 I started by heat embossing the Lovely Blooms Stamp Set partially, in gold embossing powder. Then I used my distress inks and Ecoline watercolours to watercolor the images. The watercolour was done by adding tons of water to the image and then dropping in colour. When the petals dried somewhat, I went back in to add darker pigment to show depth. I added a lot of splatters before adhering the panel onto a handmade envelope. Next, I punched a label and glued it down onto one side. This is where the name will go. To finish off. I adhered Gold Crystals to the flower centers. I hope you liked the envelopes. I made these on order for someone who liked the original design (which came from one of my cards). I dream of a house with a garden full of flowers. I made a card inspired by this dream of mine. I stamped a garden using image from Floral Trimmings stamp set and coloured it with watercolor zig markers. The house is from Whimsical Town stamp set. I stamped it, cut it out with coordinating die and coloured. The background was made with markers, too. I added some splashes there. I put everything into an oval frame cut out using Dotted ovals die set. I added a sentiment and some crystals as well to make the card look complete. Thanks for your stopping by. Have a nice day and may all your dreams come true! I was playing with some flower stamps and watercolour paint few days ago and decided to make one of the panels into a card, which I’d like to share with you today. I used Loops Die set to make a card and just had to share with you how easy it was to make a card with coloured image by using a frame die from this set. I stamped an image from Blooming Bunch onto some watercolour paper using brown ink and had lots of fun colouring these pretty flowers. I decided not to die cut the bouquet and added a light blue around the flowers. I stamped the image using MISTI and kept the stamp in it so I could stamp the image again with embossing ink and add gold embossing. 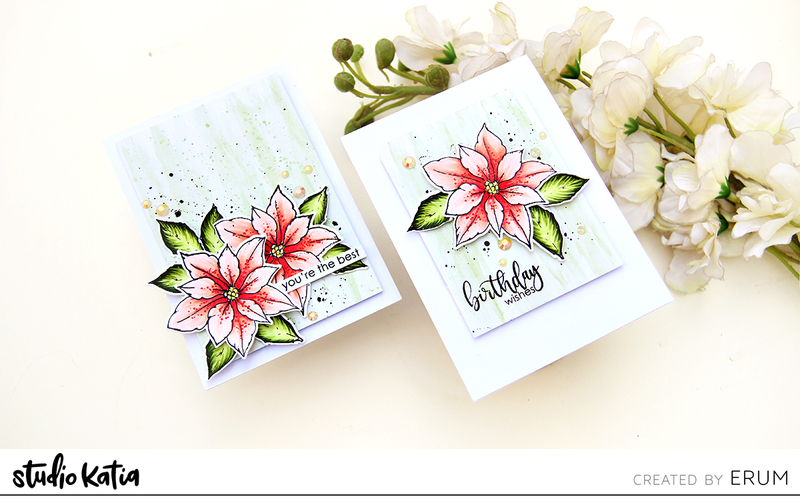 This way I avoided staining my embossing with watercolour paint. I wanted to add shiny frame around my watercoloured panel. Loops die set has a perfect frame die for that. It cuts out a panel and a pretty pierced frame. No need to measure anything. 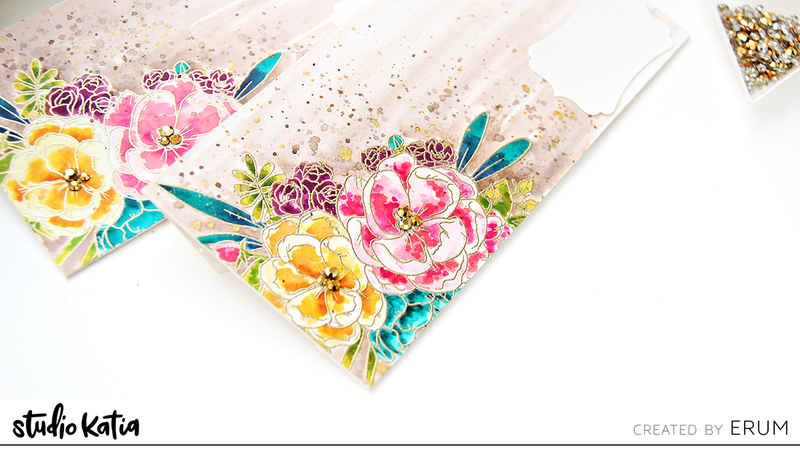 Just use the die on your panel and glitter cardstock to get a perfectly framed image. Because I used watercolour paper and heat embossed it after colouring, it warped quite a bit. What I did to fix that is cut out two panels with frames out of a white cardstock using the same die and glued three panels and three frames together with Studio Katia Glue. It worked like magic! Straightened warped paper and didn’t add too much volume to the card. Next, I needed a sentiment. I decided to add yet another golden element to my card. I die cut word THANKS out of white and glitter cardstock (same as the frame) and glued them together slightly off to have a bit of a white shadow. In order to make the sentiment stand out more, I cut a strip out of light weight vellum, heat embossed a sentiment with white embossing powder, wrapped the strip around the panel only and then glued the word THANKS above the heat embossed sentiment. I wasn’t very happy with the red flower, and that’s what helped me decide where to place the vellum strip and the sentiment. Since I chose white shadow for the word THANKS and white embossing powder for the sentiment, I adhered the panel onto white cardstock and added some Snow Chrystals, which tied all white elements together. Thank you for stopping by and have a wonderful and inspiring day!